Reared in the Midwestern suburb of Chickasha, Oklahoma, Lee Mullican was born on December 2, 1919 to Harris Nichols Mullican (1884-1972) and Zula Jolley Mullican (1887-1974). Introduced to art by his mother, an amateur painter, Mullican’s first attempt at painting came with the aid of her art supplies at the age of 15. Satisfying the wishes of his father, he initially enrolled at Abilene Christian College for two years before transferring to the University of Oklahoma for a year. Here he established his first off-campus studio -- followed by a brief enrollment at Kansas City Art Institute. After being drafted into the US Army corps of engineers in 1941, he attended topographic school in Ft. Belvoir, Virginia before being stationed in Hawaii and eventually Japan. With an abundance of available drawing supplies, access to internationally renowned museums, and the influence of art publications such as Wolfgang Paalen’s Dyn, Mullican used his considerable spare time during the war to foster artistic development. Mullican was invited to San Francisco in 1946 by Jack Stauffacher, a printer whom he had befriended during the war. Here, he devoted most of his time to Drawing and, when finances permitted, painting. A Mullican painting hanging in Stauffacher’s printing studio was discovered by the former British Surrealist Gordon Onslow Ford. Immediately taking him under his wing, Onslow Ford introduced Mullican to the members of the San Francisco art community, including Wolfgang Paalen and his wife Luchita Hurtado. Mullican, Paalen, and Onslow Ford quickly formed a collaborative artistic circle, culminating with the exhibition Dynaton in 1951. With Paalen and his wife already divorced by this point, Mullican and Luchita Hurtado began a relationship and moved to Los Angeles after the birth of their son. They subsequently married in 1954. While basing his career mostly in Santa Monica, Mullican traveled alongside his family on multiple occasions. After spending three years (1955-58) in Sao Paulo, Brazil on an artist exchange program, he received the Guggenheim Fellowship and set up studio in Rome for a year (1959-60). Until his death on July 8, 1998, Mullican worked predominantly in the Los Angeles area, consistently exhibiting while holding a teaching position at UCLA. While occasionally diverting himself with other mediums, the greater body of Mullican’s work consists mostly of drawing and, usually aided by the palette knife, painting. Most of these meticulously-constructed canvases can be found in the Los Angeles area, the center of his exhibiting and teaching career. A wide range of Mullican’s life experiences -- cultural, philosophical, and artistic -- have influenced his painting style. More than his college training, which yielded little beyond some technical development, it was Mullican’s term in the army that proved most artistically formative. Drafted into the war as a topographer, his training and eventual service in Hawaii and Japan demanded innumerable recordings of aerial photographs. This process, ingraining shapes and patterns from bird’s-eye perspectives into his drawing habits, cultivated his preexisting appreciation for naturalistic forms and abstract patterns. Additionally, access to museums and libraries of the East Coast and Hawaii during this time presented him the opportunity to ponder contemporary trends and thought in the art world, an art world effectively hidden from the Midwest. Specifically, his knowledge of (through the magazine Dyn) and ensuing friendship with Wolfgang Paalen exposed Mullican to non-western antiquity as well as to Paalen’s transcendent philosophies born out of the European Surrealist movement. Rarely is this element of paradox more evident than in examples of his Guardian canvases, completed between 1978-1980. Abstract patterns weave together vertically and horizontally, conjuring images of mysterious figures in a manner reminiscent of Pre-Colombian textiles. This historical influence --which Mullican admits to be a factor -- would seemingly locate the work within a particular time frame. However, the vague nature of the beings in the paintings, their lack of specific titles or features (along with Mullican’s insistence that they bare no chronological significance), seems at odds with the former conclusion; it speaks of universality. At one point early in his career, a friend asked him to describe the mental process that occurs while painting in the studio. Never having considered this question, Mullican realized that each finished work represented a record of an unconscious process. “…I am standing on this particular metaphysical, almost unexplainable plane in my studio, the canvas is there before me, and it‘s in this attitude that makes the painting appear.” He relies upon his subjectively-rooted unconscious to achieve objective universal truths, again indicating the element of paradox as it applies to his studio mindset. That the ultimate end of any of his paintings relies upon contradictory visual elements is perhaps attributable to this equally contradictory approach. In 1951 Lee Mullican and Gordon Onslow Ford, led by Wolfgang Paalen, collaborated on an exhibition at the San Francisco Museum of Art entitled Dynaton. Prior to this event, Onslow-Ford and Mullican both migrated to San Francisco in the wake of World War II. Paalen, publishing his magazine Dyn in Mexico and painting during the war, moved to San Francisco with the hopes of energizing his marriage to Luchita. Paalen and Onslow-Ford knew each other in Europe and, endowed with the philosophies and aesthetic of the Surrealist movement, took the task of guiding the comparatively inexperienced Mullican. Wishing to extricate himself of the confinements of surrealism or, for that matter, any style, Paalen sought a more limitless mode of creating art. Indeed, the Greek word “dyn” means “that which is possible.” The goal for Paalen, with the successive support of Onslow-Ford and Mullican in San Francisco, was to forge an ever-expanding art rooted in the timeless. As his first major group exhibition at such a critical moment in his artistic development, it comes as no surprise that Paalen’s Dynaton concept blended with Mullican’s pursuit of universal themes in his own art. California Poster. 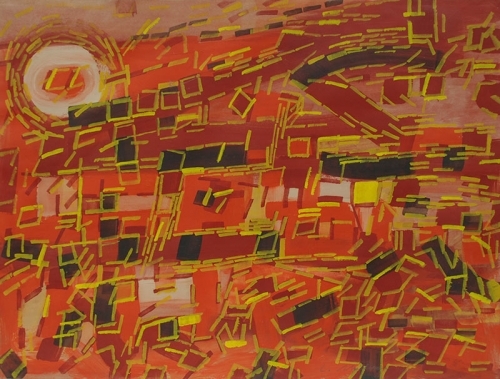 Acrylic on Canvas, 1969. Untitled. Crayon on Paper. 1950. The Green Nature. Oil on Canvas. 1967. Untitled. Watercolor on Paper. 1973. Yellow Figures. Watercolor and Graphite. 1970. Ancient Place. Watercolor and Graphite. 1973. Santa Fe. Oil on Canvas. 1970. Venice. Oil on Canvas. 1970. Solstice Rider. Oil on Canvas. 1953. 1. Mullican, Lee. Lee Mullican: Selected Drawings 1945-1980. Los Angeles, CA: UCLA Hammer Museum of Art and Cultural Center, 1999. 2. Halpern, Nora. Dynaton Before and Beyond. Malibu, CA: Frederick R. Weisman Museum of Art, Pepperdine University, 1992. 3. Visions of Inner Space: Gestural Painting in Modern American Art. Los Angeles, CA: UCLA Frederick S. Wight Art Gallery, 1987. 4. Moderns in Mind: Gerome Kamrowski, Lee Mullican and Gordon Onslow-Ford. New York, NY: Artists Space, 1986. 5. Lee Mullican: Selected Works 1948-1980. Los Angeles, CA: Los Angeles Municipal Art Gallery, 1980. 6. Los Angeles Collects Folk Art. Los Angeles, CA: Craft and Folk Art Museum, 1977. 7. Dynaton Re-Viewed: A show of three painters of the Dynaton Movement that was first exhibited at the San Francisco Museum of Modern Art. San Francisco, CA. Anglim Paule Gallery, 1977. 8. Lee Mullican Interviewed by Joann Phillips: completed under the auspice of the Oral History Program. Los Angeles, CA: UCLA, 1977. 9. Paintings of the Inner World: An Exhibition of Color in Space. Los Angeles, CA: Herbert Palmer Gallery, 1975. 10. Lee Mullican Paintings: 1965-1969. Los Angeles, CA: UCLA Art Galleries, 1969. 11. Lee Mullican. San Francisco, CA: San Francisco Museum of Art, 1965. 12. Lee Mullican: Painting, Sculpture and Drawing. New York, NY: Willard Gallery, 1959. 13. Dynaton 1951: Jacqueline Johnson; Lee Mullican; Gordon Onslow-Ford;Wolfgang Paalen. San Francisco, CA: San Francisco Museum of Modern Art, 1951. 14. Lee Mullican; an exhibition of paintings at the San Francisco Museum of Art. San Francisco, CA: San Francisco Museum of Art, 1949. 15. U.S. Census, Birth Date, Marriage Dates, Children, Death Date. Accessed through RootsWeb.com. 16. Exhibition History. Accessed through HerbertPalmerGallery.com. 17. Interview with lee Mullican Conducted by Paul Karlstrom. Washington, D.C.: Smithsonian Archives of American Art, 1993.